Carrie Carlin helps her patients get things under control. It's her own life that's in chaos. Carrie answers a plea for help from her friend Meg and flies to Key West -- and a new sea of troubles. A boat accident has left Meg's husband, Kevin, missing and presumed dead. But when his body never turns up, Carrie suspects something is terribly wrong. Then Meg is attacked. Suddenly Carrie needs more than deep-breathing exercises. She needs to troll the Florida Keys for Kevin. She needs the help of her lover, homicide cop Ted Brodsky. And she needs to fish around for hard answers and chilling secrets... before a killer lures her in with a deep, deadly surprise. and Katherine Hall Page will like this one." 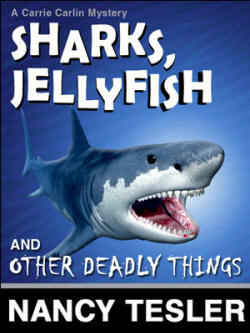 “Sharks, Jellyfish and Other Deadly Things has lots of questions, lots of humor, a bunch of attractive men, more than one slimy character, a humungous fish tank....But most of all there’s Carrie Carlin. Nancy Tesler has made her warm, funny, gutsy, vulnerable and loyal. If we’re lucky we all have a friend like her. In the meantime we can take her home in a book.